5 Why are they a problem? We already know that plastic is a problem. We use articles like plastic bottles or bags once or a handful of times and then throw them out. Plastic cluttered beaches, massive landfills, and sea animals with clogged stomachs are clear evidence of this problem. However, what has only begun to become clear in the past few years, is that there is also a consequence of plastic that is harder to see. Tiny pieces of plastic (5 mm or smaller) are termed microplastics, and just because they are smaller doesn’t mean that we should ignore them. They have disastrous consequences for marine life and health, not to mention that the plastic could remain in the water forever! Microplastics can be categorized by their source. There are two main types, primary and secondary. 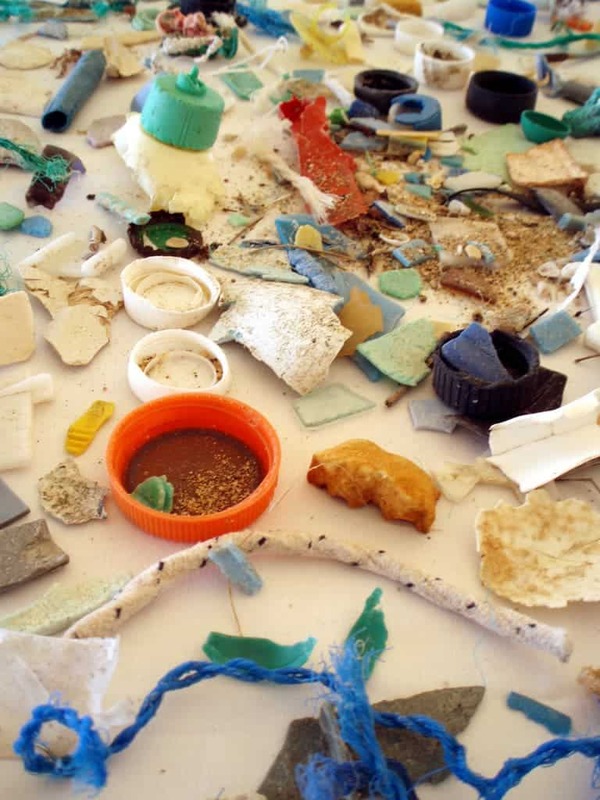 Primary microplastics are purposefully made to be that size, while secondary microplastics are bits of plastic that break down from larger pieces. There is another group that has only recently been discovered, that come from the human use of objects. Primary microplastics were created by the manufacturer to be a certain tiny size for a particular purpose. The one that you have probably heard about the most are microbeads. They are little plastic spheres used in face washes, cosmetics, and toothpastes to exfoliate or scrub. They are usually made out of polyethylene (or polypropylene, polyethylene terephthalate, or nylon), so look out for these words when you buy products at the drugstore. Traditionally, natural substances like ground almonds, salt, or oatmeal were used, but they started being replaced by plastic about 50 years ago. Perhaps surprisingly, we only started learning about their negative consequences in the past few years. Microbeads have gotten a lot of media attention recently, and several countries have banned them, including the US with the Microbead-Free Water Act of 2015. Unfortunately, they only make up 2% of total microplastics released. 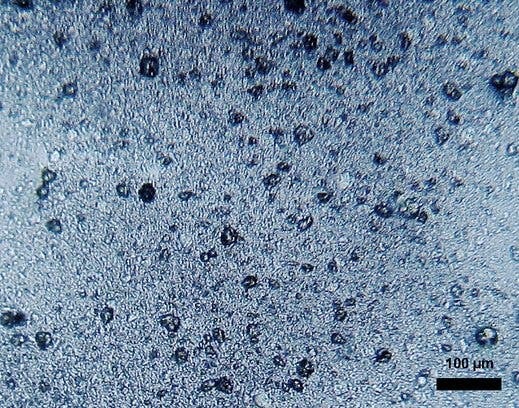 Polyethylene-based beads in toothpaste with a diameter of approximately 30 µm. Image credits: Dantor. Microplastics are also used for air blasting technology. Little bits of plastics (usually acrylic, melamine, or polyester) are blasted at a high pressure at machines, engines, or ship hull to get rid of paint or rust. They are reused until they aren’t effective so they can become contaminated with heavy metals. Microplastics are also used in biomedical research for various techniques. Larger pieces of plastic can break down over time and release these small pieces into the environment. Weathering, such as from waves, sunlight, or other physical stress, breaks the plastic into smaller pieces. Usually, it originates from waste that wasn’t managed properly. For example, the waste in the “Garbage Patches” degrade into smaller pieces, and there is a lot of trash there! Plastic bags and fishing gear are some examples of common garbage that break down. These microplastics usually have more variable shapes. Garbage not properly disposed of can break down into smaller pieces. Image credits: NOAA Marine Debris Program. A third category is somewhere between primary and secondary microplastics. Although they weren’t specifically made to be the size that they are, they do originate directly from human use so some argue that they should be classified as primary microplastics. These microplastics come from the human use of an object that gives off microplastics. Unfortunately, it is a harder choice to stop creating them than deciding to buy a natural face scrub. The two most common sources are from tires and machine washing synthetic fabrics. One study found that between 15% and 31% of plastic came from primary microplastics (they considered this category as primary microplastics). Of this, the most (two-thirds) came from synthetic fibers that came off in the wash and bits of tires that came off from driving. Most of car tires contain synthetic rubber and it is rubbed off on the road and eventually washed to water sources. Rubber also falls off from shoes as they are worn. 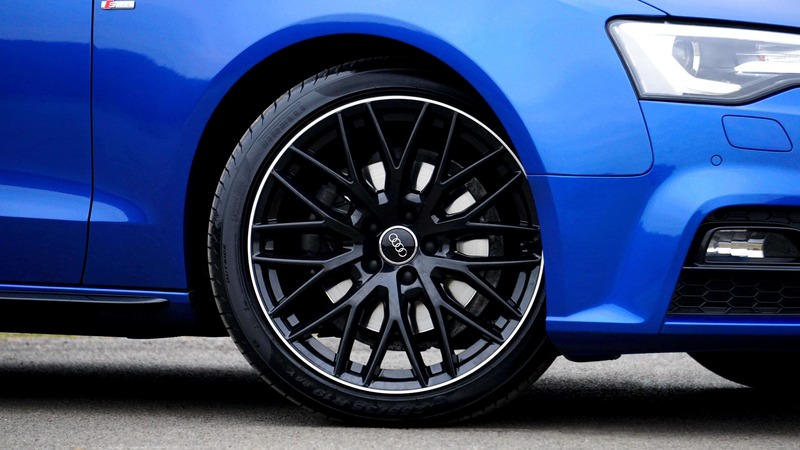 Driving a car creates bits of plastic from the wheels rubbing against the road. Image credits: Pexels. Clothing can give off a lot of synthetic fibers when machine washed. Fleece gives off the most, though athletic wear and other synthetic fabrics do also. Thye release thousands of fibers every time that you wash them. One fleece jacket in the wash can release up to 2 grams of microfibers per wash, some 250,000 fibers. 40% of them make it past wastewater treatment and out into water systems. In some areas, the amount of microfibers in the water far surpasses the number of microbeads. For example, in the Ottawa River 95% of microplastics were actually fibers. The problem with microplastics is that they are so small that they are usually not picked up by water filtration and make it out into rivers and oceans. Microplastics are bad because fish and other aquatic animals eat them and they die or have health problems. Not only fish are affected, so are worms, zooplankton, and crustaceans. Fish then eat these prey species and the plastic accumulates inside of them. They can feel full because their stomachs are full of plastic and not get enough of the food that they actually need. And let’s not forget that humans eat fish and sea salt, therefore, ultimately, the plastic ends up in us! The microplastics never dissolve and stay in the ocean forever. Plastic does not biodegrade because it is new to the environment and bacteria have not evolved to break down the carbon-carbon links found in plastic. Plastic can constantly be broken down into smaller pieces but will always remain there. Only if and when bacteria evolve the ability to break down plastic on a large scale (there have been some isolated cases) will the plastic be biodegraded. Let’s not count on that. Major changes need to follow on an industrial (such as for fleeces and tires) and governmental level (such as laws for managing ocean waste).